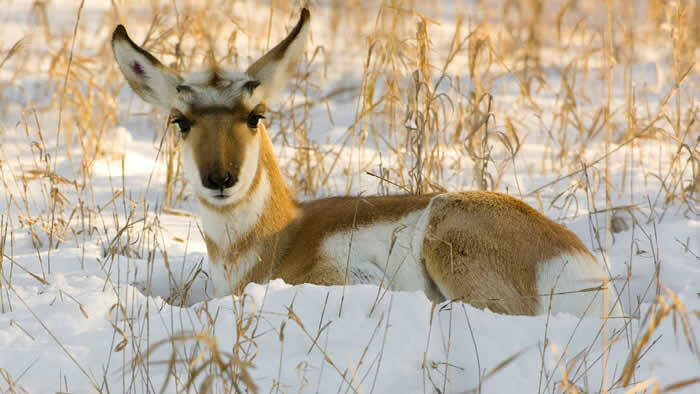 Minnesota’s bone-chilling winters and hot summers are nothing for the pronghorn. This animal’s outer hair, which can be raised or lowered to ventilate the body or seal it off from the cold, allows it to tolerate temperatures from well below zero degrees to 100 F.
Diet consists mainly of forbs (non-woody flowering plants) and grasses and brush. Pronghorn are one of the few large herbivores that can eat sagebrush. Pronghorns roam the wide-open spaces of the American West where annual precipitation is 8–15 inches per year and a variety of grasses, forbs, and shrubs abound. They share their habitat with a number of other animals, including coyotes, rabbits, prairie dogs, and snakes. They can find sufficient food not only in short-grass and tall-grass prairies but also in shrubby steppe habitat and semidesert terrain. Pronghorns avoid areas with trees. In summer they travel in small groups. In winter they may gather in herds of 1,000 animals. Close to extinction in the 1920s, pronghorn have recovered to the point where there are about 700,000. Fifteen states have pronghorn hunting seasons. 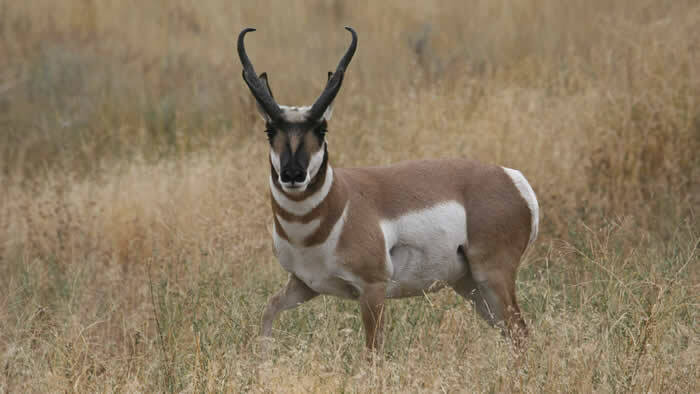 Pronghorns are thought to have evolved during the Pleistocene (1.8 million to 10,000 years ago) with a cheetah like cat, which explains their great speed. With a top speed of 55 mph, the pronghorn is the second-swiftest animal in the world. Only the cheetah is faster. The pronghorn is the only animal in the world whose horns are branched or pronged. It also is the only animal that sheds its horn sheath. A new horn grows on the bony core, which is not shed. Pronghorns are very curious animals. Settlers often waved a red flag to lure them into rifle range. 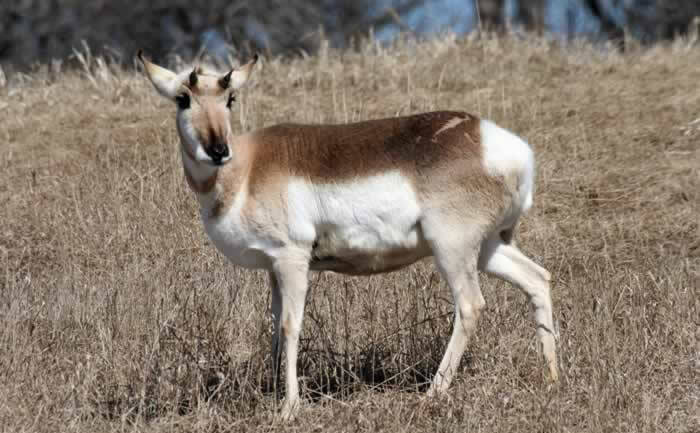 The pronghorn is found only in North America.